The Sources of Ahmed Shaheeds are all has private motive( Biased / partial) . The tune of Mr. Ahmed Shaheed in his report was milder than the texts / scripts published in the media.But the answer we gave was to the original report and it was on what was written .Unfortunately this report is following the political motive and the sources of this reports are biased . 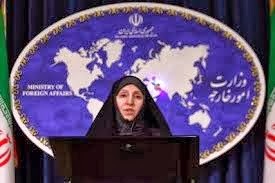 unfortunately the issues which was raised in the past about the reports on the answer to questions and ambiguity's were absent in the report and therefore it is regrettable that the report did not take Iran's situation into the consideration and we hope this political and biased situation will change and we will see a report based on Iran's situation . The report also did not mention anything about the people's participation in the last election. 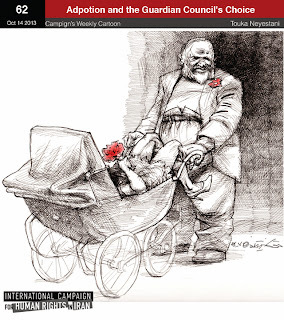 More than 30 years of injustices and Iranian Citizen's suffering ! There are reports that Ms. Pegah Ahangarani an international award winning young Iranian actor and director is sentenced to 18 months in jail and 3 years ban from leaving the country.Ms. Pagah was also arrested and detained for 17 days after the presidential election coup in 2009 and her support for green movement.Ms. 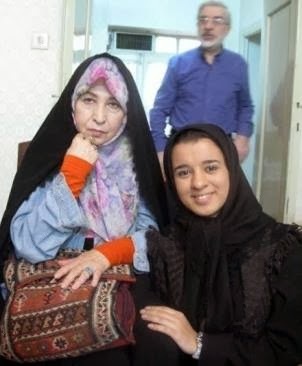 Pegah Ahangarani's mom Mrs. Manijeh Hekmat is also a film director. Ms. Pegah is facing this harsh sentencing because of her critical views against the fundamentalists ideas or views. She made a documentary against a fundamentalist director known as Dehnamaki who in the past was acting as the leader of the " Hezbollah " a fundamentalist pressure forces against the reformist personalities , reformist medias or reformist Government. 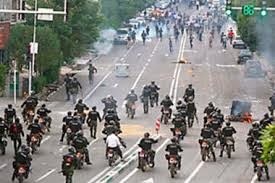 Iran need the Rule of Law ! Iranian must call for the reform on judiciary System and the rule of law! Protest must channel against the judiciary system and injustices! In the path to a civil and democratic society , protest and demands for reform on judiciary system for carrying justice is crucial. More than 100 years ago Iranian in constitutional Revolution demanded for " Edalatkhaneh" meaning ( House of Justice or Justice House) and Constitutional Monarchy. During this revolution the shah of Iran stepped aside and accepted to reform the system although late his son nullified the constitutional monarchy and announced himself as king and holds all power in his hand. Edalatkhaneh or House of Justice was during all these years was denied to Iranian. And the Justice system we had since then was all partial and influenced by political systems and Governments. 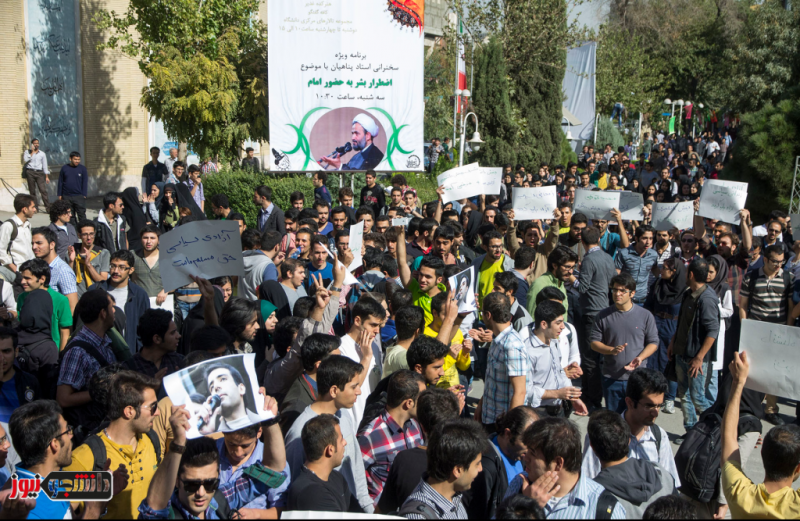 We the Iranian need this reform and a real judiciary system which is independent and not influenced by the system. As long as we the Iranian have these type of Judiciary that we have at present time,the democratic changes is impossible. Democracy comes when there is a rule of law and everyone in the society or as citizen share or benefit the same and equally. The current judiciary system is so corrupt and influenced by the political or ideological islamic system that makes it hard to carry justice in the country. 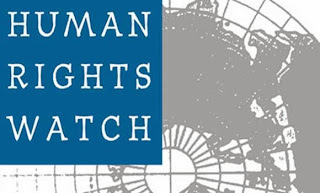 (Beirut, October 29, 2013) – Iran should issue an immediate moratorium on executions in light of continued revelations of unlawful or politically motivated executions following flawed trials, Human Rights Watch said today. On October 26, 2013, the government executed 16 people in what the prosecutor said was “retaliation” for the killings of more than a dozen border guards along the Iran-Pakistan border. In unrelated incidents, rights activists also reported that authorities had executed two Kurdish prisoners without warning on the same day. Rights groups have documented more than 400 executions in Iran so far in 2013, with at least 125 of those carried out since the election of President Hassan Rouhani on June 14 in a judicial system that is rife with due process failures. 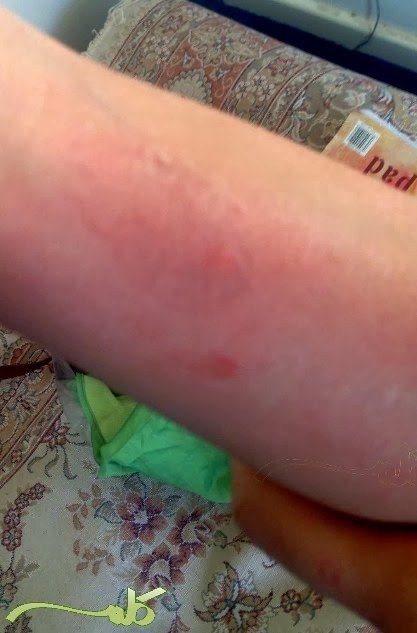 Violent Behavior by security forces of the Islamic regime towards political prisoners and their family members must be monitored ! 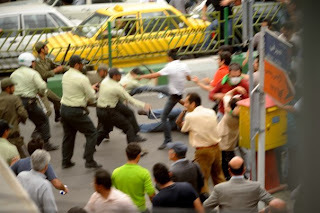 Human Rights Organization inside and outside Iran with the help of victim of abuses need to monitor and report the violence behavior ( Physical ,mental abuse ...) of the judiciary , disciplinary , security or prison elements/forces against prisoners and their family members and by doing so , it will bring not only public awareness but it will also brings into the attention of judiciary and Government officials. Investigation ,Documentation and report of even petty crimes of abuses as such by regime elements/ forces will strengthen human rights defenders in the society and narrows down and in the long term will minimize these type of abuses. Abuses against prisoners and their family members by Islamic Regime is nothing compare to daily public hanging but it is of significant in creation of public awareness and mobilization of public against these abuses by regime elements and therefore asking regime to respond. These people were charged based on " Maharebeh" ( Battle against Islam) and corruption on the earth ( Fesad felarz) by membership to a terrorist organization. They were all hanged on Saturday. Were all hanged based on possession of heavy loads of Narcotic drugs. Winter Came Soon to Spring . 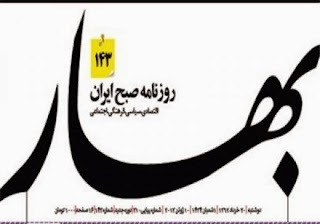 The Media Watch Dog ordered for the closure of Bahar ( Spring) Newspaper ! temporarily closed the paper. 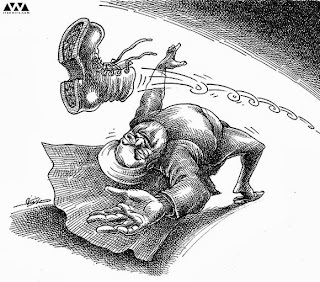 Same situation was happening under Khatami's Government. The article was written by Mr. Ali Asghar Gharavi and the editorial manager of the paper apologized for printing the article . This article was printed on the eve of " Eid Qadir " . Now the fundamentalists and Judge Saraj leader of the Media Watch Dog believe publishing the article was deliberate by Bahar newspaper and will continue the investigation on the case file. 1- "Dog Training Unit" is added to the gallery of Islamic regime repressive forces against ..... Future Protesters. 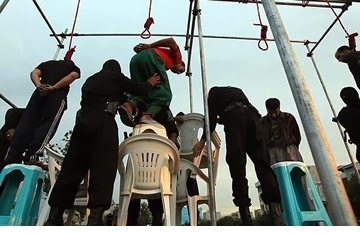 Mass public hanging continues......Do we or UN care what is going on with continued public hanging by Islamic Regime in Iran ? 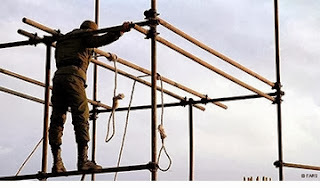 Islamic Regime in Iran hanged 16 political prisoners just in retaliation and revenge on the killings of its forces ! UN Must Stop Islamic Republic on Public Hangings ! Islamic Regime in Iran and the Epidemic of Public Hanging by Totalitarian regime and despots on staying in Power and creating the atmosphere of fear in the country!!?? According to Fars News Agency, 14 Border patrol officers were killed last night by terrorists and in retaliation this morning Islamic Regime hanged 16 political prisoners from that region!!??? ISNA news agency reported 14 patrol officer were killed 6 wounded and 4 were taken hostage and the terrorist returned back in Pakistan border with Iran.President Rohani ordered a team to investigate the issue and situation. ISNA also reported that, ministry of Foreign Affairs sent a protest by calling the Pakestani attache about the incident at Pakestani- Iran border. Public prosecutor of the court of revolution in the city of Zahedan today announced it executed 16 political prisoners in retaliation to the last nights killings of 14 border patrols officers in " Saravan " region at the south East part of the country close to Pakistan and Afghanistan. 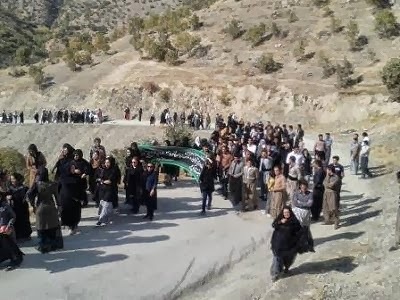 Mohammad Marzieh on speaking with the reporter said, the 16 individuals who were executed had connection with the killing of border patrol officers of " Sistan & Blouchestan " province. Mr. Marzieh said, this is a strong message to the terrorists. According to news A Kurdish political prisoners Mr. Habibolah Golparipour was executed last Tuesday inside Orumieh city prison on the charges that he belonged to one Kurdish political parties. 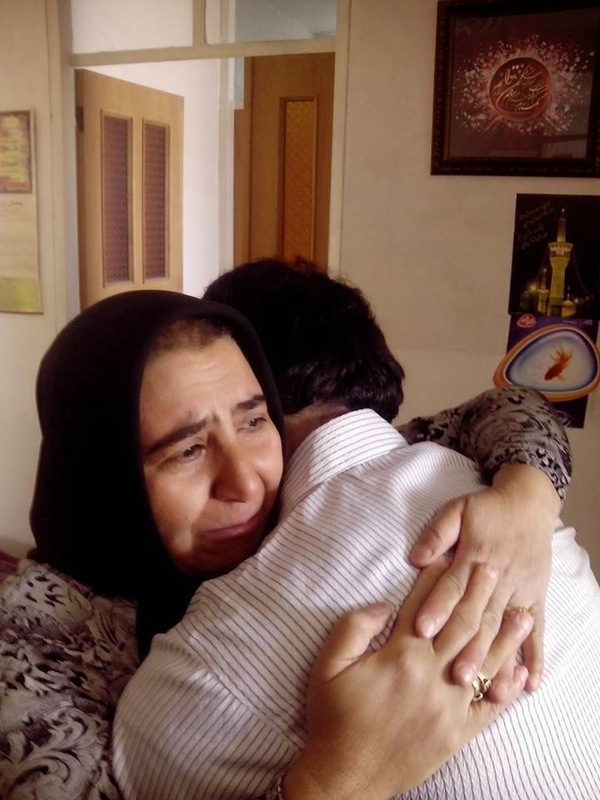 Mr. Golparipour was arrested by security forces when he was leaving the city of Mahabad ( One of Iranian Kurdistan city) and was transferred to prison and kept in solitary confinement for months and went under intense torture and confession. 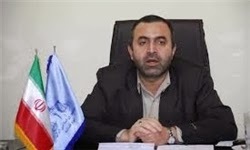 Judge Hadadi of the court of revolution in the city of Mahabad sentenced Mr. Golparipour to death. 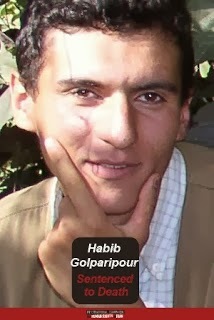 Mr. Habibolah Golparipour was 29 years old at the time of execution. According to Habibola's father, The security and prison authorities won't give back the dead body of our son for a proper burial . The father said: My son's never carried a gun and his only crime was e publishing and carrying books.
" The Embassy of the country Oman will act as Iran's protectorate in Canada". AFP – Iran so far has not made significant improvements on the human rights front, the top UN official for the Islamic republic’s rights situation said Wednesday. 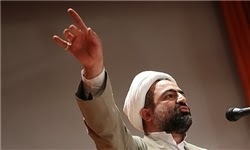 “The human rights situation in the Islamic Republic of Iran continues to warrant serious concern, with no sign of improvement in the areas previously raised by the general assembly or the various human rights monitoring mechanisms,” Special Rapporteur for the situation of human rights in Iran, Ahmed Shaheed, wrote in a report. Despite promises made by new President Hassan Rowhani, the UN rapporteur told the General Assembly in a report that he had tallied 724 executions in Iran between January 2012 and June 2013 including 202 in the first half of 2013. Most of the executions were linked to drug trafficking and Shaheed again urged Tehran “to reconsider laws that define drug-related crimes as capital offenses. 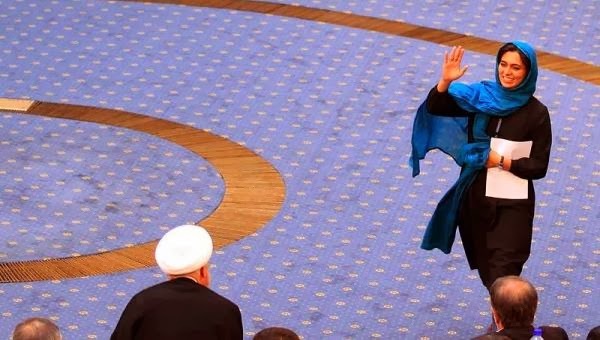 In addition, he pressed for the Islamic republic to “declare a moratorium on all executions, ban public executions including stoning and limit capital punishment to offenses considered to be serious crimes under international law,” the report said. The rapporteur also voiced concern at the jailing of journalists, and tough restrictions of freedom of speech especially online. Since January 2013, at least 40 journalists and 29 Internet users have been arrested in Iran, often in national security or propaganda cases, the report found. Authorities shut down 67 Internet cafes in July and blocked about five million websites, it found. 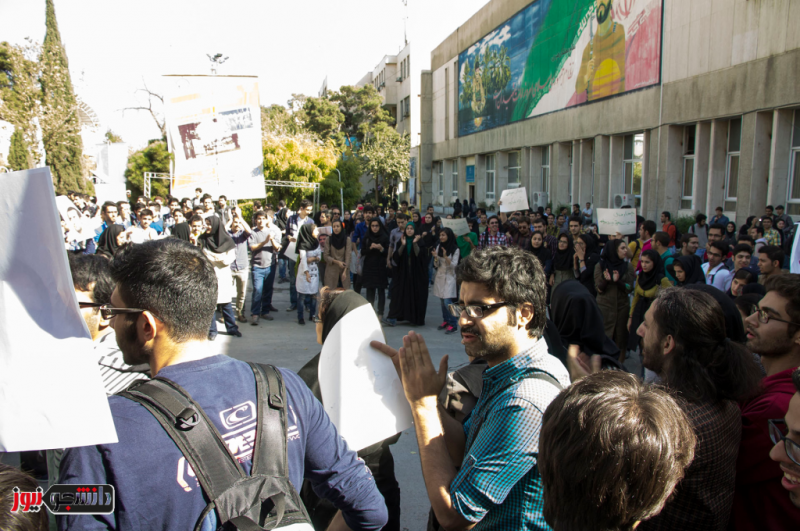 But an Iranian diplomat shrugged off the criticism saying that “Iran, especially after the election of President Rowhani, has put a new emphasis on its unwavering dedication towards the promotion of all human rights inside and outside the country. 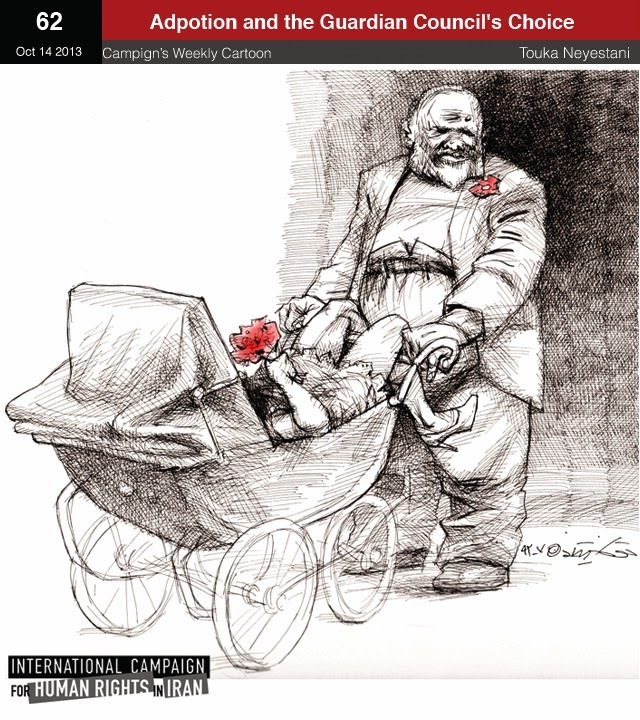 “The report is a product of a non objective and counter-productive exercise initiated by a group of countries with specific political claim against Iran…… a catalogue of poorly resourced and outdated allegations,” he insisted. Students of Polytechnic University in Iran celebrated Majid Tavakoli's few days release from long time prison in Rejaei Shahr prison without access to Phone and use of his few days vacation from prison for 4 years. Some placards read: " University isn't Barack's " - " University is Alive " - " Majid Tavakoli Welcom to Vacation"- " Political Freedom is Our basic rights"- " Political Prisoners must be freed" - " Majid Tavakoli is the dignity/honor of the Student Movement"
Canada drew another point at the FIFA U-17 World Cup UAE 2013, finishing even 1:1 with Iran in the second group match of the competition. The two sides traded goals on either side of the half of the 22 October match at Rashid Stadium in Dubai, UAE. 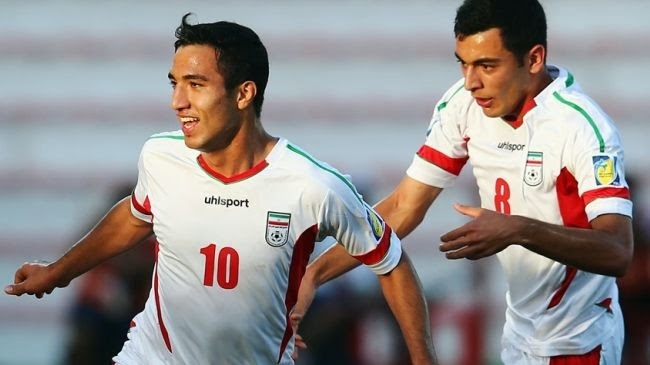 Amirhossein Karimi opened the scoring in the 9th minute with a shot from distance, but Jordan Hamilton equalised in the 48th minute as Canada came roaring out of the gate in the second half. Iran finished strong and thought they might find the winner, but Canada’s man of the match Marco Carducci was the difference in earning Canada a point. This marks Canada’s sixth participation at the FIFA U-17 World Cup UAE 2013, with this year’s edition featuring players born 1996 or later. The 24-team tournament runs 17 October to 8 November. Canada’s next match at the FIFA U-17 World Cup UAE 2013 will be in three days when Canada faces Argentina on Friday 25 October (live on Sportsnet World, 12.00 ET / 09.00 PT). MP Ali Motahari said:" Khamenei's said NO to Mr. Tofiqi a candidate by president Rohani for the post of Science & Education Minister." This violates the constitution which allows only members of parliament to decide on the approval or disapproval of ministers and not any other officials including leader of the Islamic regime Ali Khamenei. 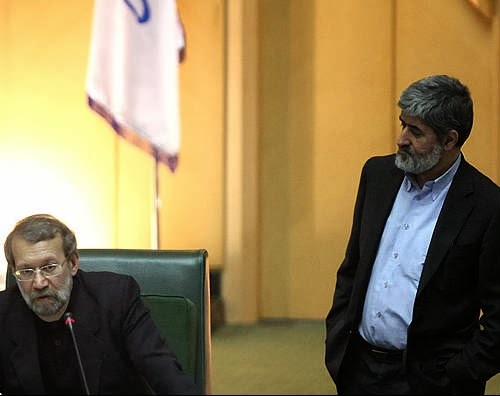 Right after this , Ali Larijani speaker of the parliament and brother in-law of Ali Motahari rejected Ali Motahari's comments on leader and said: Leader would never interfere into the state's Three power ,the parliament, the Government and the Ministry of Justice. 2- The public hanging and inside prison hanging continued in the past week despite of international human rights organizations call to stop the executions inside Iran. 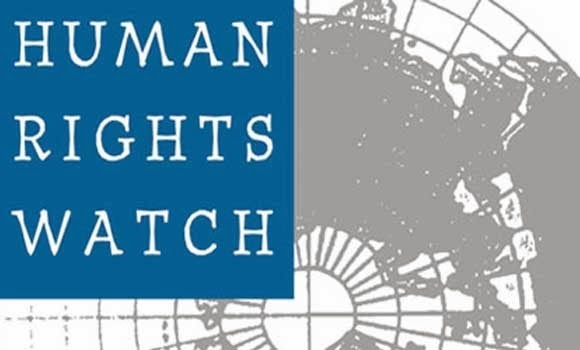 many Iranian individuals criminals or political opponents are on the death row among them Kurdish Iranian, Iranian Bluchi's , Iranian Arabs in the Persian Gulf area and others. 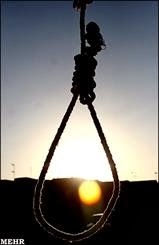 According to news in the early morning of yesterday a woman together with six other men were hanged inside "Dizel Abad" prison in the city of Kermanshah. 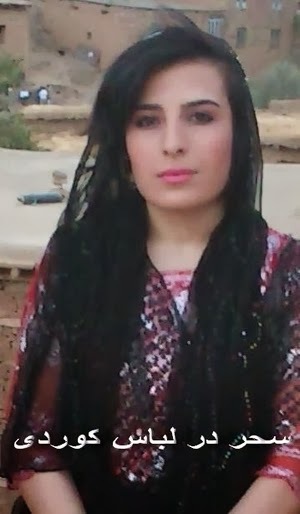 the woman's name is Nastaran Safari 26 years old and her charges was murder and she was hanged on the bases of Islamic law of "Ghesas". 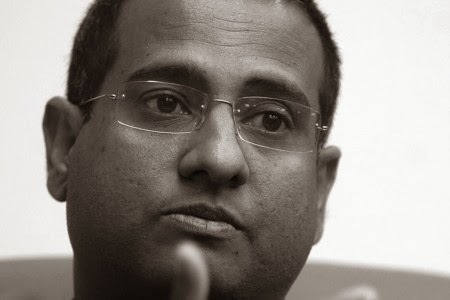 Doctor Ahmed Shaheed UN reporter on human rights situation in Iran reported about the high number of execution . The report says between Jan. 2012 up to June this year 724 people are executed inside Iran. 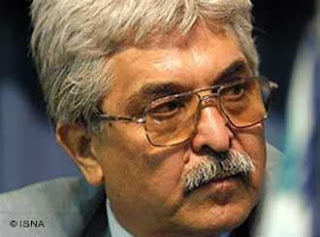 Mohammad Seifzadeh an Iranian lawyer and a front runner as human rights defender's life is in great danger ! President Rohani , Three Human rights lawyers are still in Prison , what are you going to do? 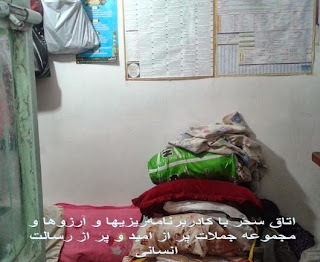 According to news coming from Iran , Mr. Mohammad Seifzadeh a prisoner of Rejaei Shahr prison , a lawyer and front runner as human rights defender who suffers from hearth problems was transferred from prison to hospital. He was transferred to the hospital on Tuesday while he had same experience in the past as well . 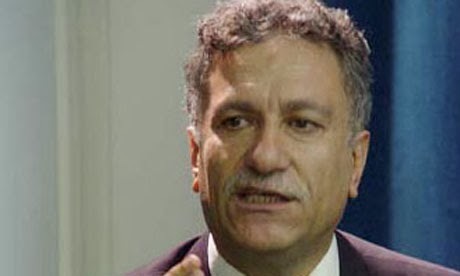 Mr. Seifzadeh was summoned after the presidential coup in 2009 and was sentenced to nine years imprisonment and 10 years ban from working on his profession , later the appeal court reduced the sentence to two years imprisonment, and he was charged with breach of national security. Mohammad Seifzadeh, Abdolfatah Soltani and Mohammad Ali Dadkhah. 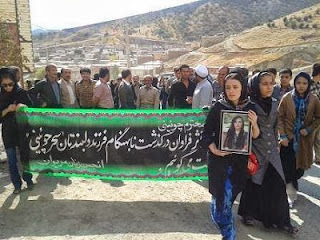 President Rohani must create a Team to look into the death of a Kurdish student Sahar Choini !!??? In recent days a young Kurdish girl Nursing student of Hamedan University ( Ms. Sahar Choeini )was found dead in her room at the campus. Early report indicate she died as a result of a blow on her head but officials reported later she hanged herself in her room. This created anger and uproar among Kurdish people of Marivan city and Hamadan University student . If she has been killed, who is behind it ? A Thorough investigation is needed to find what happened to this girl? People need response from the Government. It may be a plot by extremists against Rohani's government to create unrest in the universities !!??? 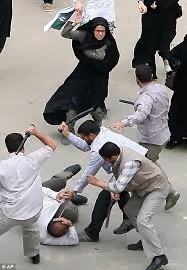 This isn't the first time ....Time and time again this type of killing happened in Iran ,even during Mohammad Khatami's reformist Government which is known as " the chain murdering". This pictures show people in Marivan carry the body to bury. 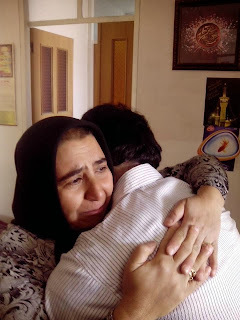 The law was originally approved by the Iranian Parliament in 2009 and at that time, marriage of foster parents and adoptive children was strictly forbidden, but the Guardian Council had found this law incompatible with Sharia and the Iranian Parliament modified the bill to allow for the marriage through permission obtained from a judge. The issue has to do with the Islamic Sharia’s hijab requirement for men and women who are not members of each other’s immediate family through blood. 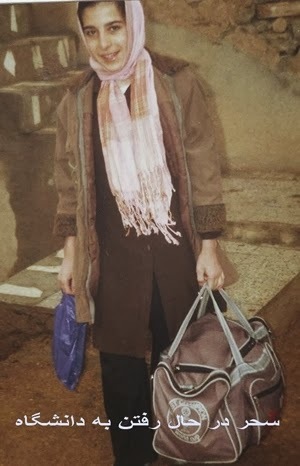 An adopted daughter is expected to wear the hijab in front of her father, and a mother should wear it in front of her adopted son. In an interview with Iranian Labor News Agency (ILNA), Mohammad Nafrieh, the Deputy-Social Affairs for the State Welfare Organization said: “Contrary to the current discussion, this amendment in fact puts a stop to the possibility of marriage between foster parents and their adopted children…I can tell you that such marriages are not as rare as one might think. We have had cases like these in the past and based on the informatio I have, I consider this amendment to be a step forward which can reduce the number of such marriages in the country.” The State Welfare Organization, however, did not provide any statistics about the number of such marriages. 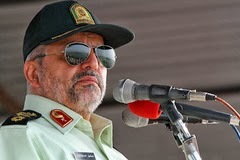 1- The commander of Disciplinary Forces Esmail Ahmadi Moghadam on the issue of Mr. Khavari the Iranian Bank Melli boss who escaped to Canada because of 3,000,000,000 Billion Dollar Embezzlement said: The police in Iran had signed cooperation with police of Canada on extraditing the criminal . While the Government of Canada won't cooperate and at first did not even admitted this person is in their country at all, but after we proved of him being there , they have said they do not know his whereabouts , But we offered to look into the case file together until this file is closed. 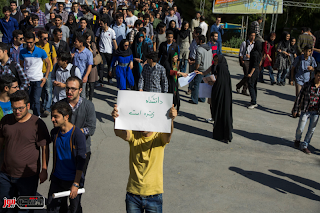 The policy of Islamic hegemonism is what the Islamic regime in Iran carries around the world. Most of the energy of this regime is spent on policies which are obsolete and the Iranian people unfortunately have to pay the price for it. World have already experienced the period of middle age and the rule of religion and Church's and Iran also has already experienced the rule of Islam ( both Sunni and Shiite ) since 620+ AD . Internal & external conspiracy as well as protecting and maintaining the status quo is one of the reason in preventing democratic movements to achieve its goal, meaning the creation of a democratic society in the middle East . Under the current situation both the ruling Islamic elite and the foreign oil & Gas companies share the same goal ,to sell ( As much as possible and collect oil & Gas Dollar ) and to buy ( Cheap oil & Gas and make more profit) . And continue the policies such as the issue of Nuclear energy and threat of Shiite against Sunni's and sell arms and keep the level of tension high in the region. Who is benefitting of this situation? Dragging the talk on nuclear energy for years........and at the same time keeping the level of tension in the region as danger as it is now. But , Iranian people have so many unsolved issues and freedom is just one item on the agenda. 1- The news had always been like this . By looking at the news websites,one can easily find out that if regime releases the political prisoners one day ,it also arrests several others the next days. 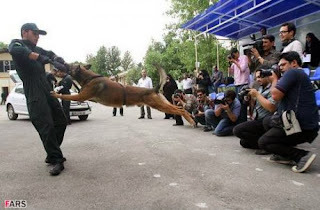 This has been the trend for the entire 34 years age of the Islamic regime in Iran. This is because the judiciary of the Islamic regime is partial and political and runs by Islamic ideology and it become a systematic policy of the regime to act this way to intimidate the dissent /critics and oppositions. It is because it find it very useful for its regime to continue its political life. For instance, recently the agents of the ministry of information called Arash Sigarchi's ( A journalist -who is living in exile in America and work for the Voice of America) home and asked his parents together with his father in-laws to go to their office for questioning . They asked his parents to tell to Arash to resign from voice of America and find another job for himself and if he continues to work for VOA, the ministry of information will hurt him even in America.This is an act of harassing and threatening and intimidation to silence the journalist by inviting the parents to ministry for questioning or possibly arrest and detention. According to Arash, his family was threatened to confiscation of their properties and imprisonment and ban from leaving the country. These acts had happened in the past on many many Iranian. We the Iranian are familiar with regime policies. Arash Sigarchi says: "i wrote a letter to Mr. Rohani and explained the situation because he is the president and he has studied law and had promised to Iranian people to defend their rights . I told him that, the ministries behavior towards my family and my in-laws are unacceptable and immoral and i dont want to come back to Iran and I have no intention to stop working for VOA and others, but these actions are immoral and illegal. 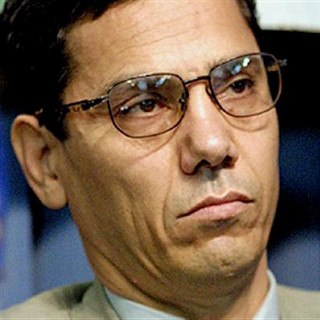 Arash Sigarchi is an Iranian Journalist who was arrested in 2004 on charges of "conspiracy and activities against national security " due to critical articles he published and interviews with foreign broadcasting he had, he was sentenced to 14 years imprisonment but after spending two years in prison, he was diagnosed with cancer and was released on bail. But left Iran and is currently living in US and works for VOA . 2- The managing editor of " Entekhab " website is arrested. Mr. Mostafa Faghihi was arrested today Monday and was transfered to ward 350 in Evin prison. He is charged with " publishing lies to disturb the public minds". 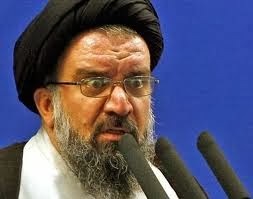 Zarif Invited Pilay to visit Iran ! Navi Pillay meet in New York, Monday, September 30, 2013. Iran’s Foreign Minister Mohammad Javad Zarif has met with UN High Commissioner for Human Rights Navi Pillay, discussing the global approach toward human rights. 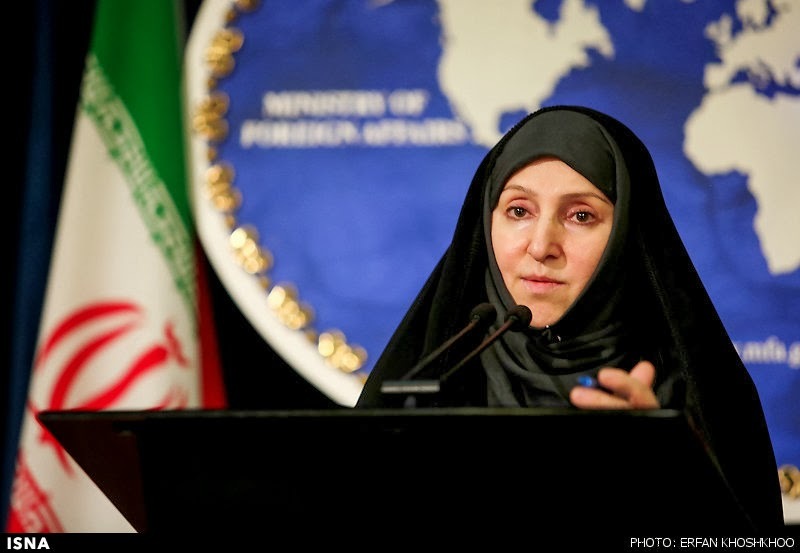 During the meeting in New York on Monday, the Iranian foreign minister said there should be a change in the current global approach toward the issue of human rights. Zarif stressed the necessity of approaching human rights in the true sense of the term, not as a political tool and a politicized issue. 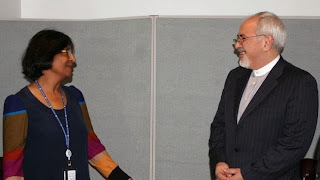 The Iranian foreign minister also invited the UN official to pay a visit to Iran in the near future. Pillay, for her part, welcomed the invitation and stressed the interest of Office of the UN High Commissioner in expanding cooperation and interaction with the Islamic Republic. Islamic regime in Iran and 22 Iranian Kurd in the list of death sentence ! NO to Death Sentence ! 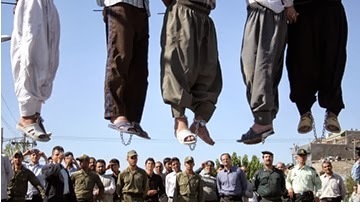 Islamic regime in recent years executed at least 11 Iranian Kurd !